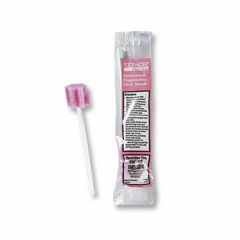 Toothette Oral Swab are designed for patients who can perform all or most of their oral care, but who may also require some nursing assistance. Provides adequate oral hygiene for patients who may also suffer from mild oral dysfunction. Soft, secure foam heads with distinct ridges gently lift and remove debris and mucus from oral cavity. Use to gently stimulate tender oral tissue and clean between teeth. Ready to use. Individually Wrapped. Disposable. Gentle On Gums. Easy To Use. Durable. Cleans Hard To Reach Spots. Clean Teeth. I was ordering these from my local pharmacy where I get our prescriptions-at $40.00 per box, and the price I paid for these-much more reasonable! Love the fact that you offer free shipping to loyal and frequent customers-thanks! Gentle On Gums. Easy To Use. Cleans Hard To Reach Spots. No added toothpaste. No added toothpaste. Reasonable price . Stays intact during use. individually wrapped. Use after regular brushing of teeth to clean the pockets in the back four quadrants of the mouth of any accumulated debris not removed by brushing. Used for my TBI son. Gentle On Gums. Easy To Use. Clean Teeth. Cleans Hard To Reach Spots. Easy To Use. Gentle On Gums. Durable. Love the pricing. Got shipment super fast. Has anyone had the sponge tip come off in the mouth? I have with another brand and it could have been life threatening to my daughter who is brain damaged. Now I'm afraid to use any of them. I have been using this brand of mouth sponges for 5 years on my mother who had a stroke. I have never had a problem with the sponge tip falling off or any problem with them at all. I've used these for the past year with my Aunt, and haven't had any issues with the heads coming off -- however, I was told by a nurse that you should not leave them soaking in liquid because that causes them to disintegrate (a choking hazard) and that's when the head would come off. So don't reuse them and don't leave them soaking in liquid. They are meant for one-time use. I actually did have that happen, just one time a few years ago. I have used them for over 10 years also with a brain injured person, so that one instance doesn't bother me. It might not be a good idea to use them if your patient has a bite reflex and cannot release quickly. I have never had a problem with the swap tip falling off and my sister barely opens her mouth for cleaning. What country do this toothettes come from? And where the foam piece comes from? They are labeled as made in the USA, implying that the individual components are also, but that is not explicit. The toothette package says they are made in the USA. Is this swab suitable for clearing build up of mucous or applying ointment in a horse's eyes with inflamed conjunctivitis? These swabs are not sterile. I would think that would be an issue if using on the eye itself.